BACKGROUND: In today’s health care environment where resources are scarce discharge planning is an important component of resource allocation. Knowledge of the factors that influence discharge disposition is fundamental to such planning. 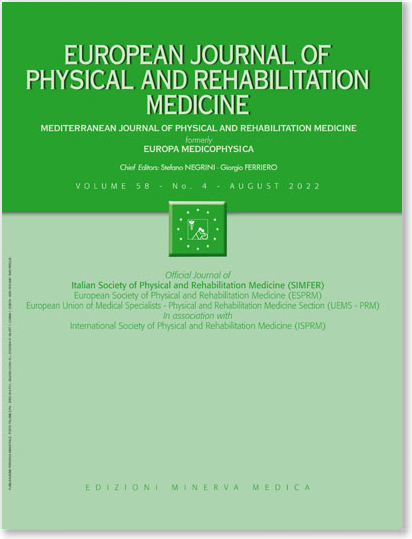 Further, return to home is an important outcome metric related to the effectiveness of a stroke rehabilitation program. AIM:To test the hypothesis that the patients who have a caregiver at home willing to participate in the care of the patient discharged from a stroke rehabilitation unit are more likely to be discharged home given other predictive factors being the same. DESIGN: Retrospective cohort study using binary logistic regression analysis with outcome as discharge home vs. discharge not home after in-patient stroke rehabilitation. SETTING: Hamilton Health Sciences multidisciplinary integrated stroke program unit. POPULATION: During this period, 276 patients were admitted to the integrated stroke unit, of which 268 patients were living in the community prior to hospitalization. The remaining eight patients were admitted from a care facility, such as a nursing home or assisted living facility. Since a sample size of eight is too small, these patients were excluded from the analysis. As such, the analysis is based on the 268 patients who were living at home prior to the onset of stroke. METHODS: The data points collected during the study period were age, gender, days from stroke onset to rehabilitation unit admission, pre-stroke living arrangement (lived alone vs. lived with spouse, partner, or another family member), FIMTM at admission, type of stroke, laterality of impairment, and discharge destination (i.e., private dwelling vs. nursing home, assisted living facility, or back to acute care). RESULTS: As established by a number of previous studies, the most significant predictors of home as discharge destination was admission FIMTM. However, the second most important predictive factor for home discharge was prestroke living arrangement (lived alone vs lived with spouse/partner/other family member) as hypothesized by the authors. CONCLUSION: Literature is rich with studies showing functional independence to be the most important predictor of home as discharge disposition but our analysis shows that pre-stroke living arrangement, i.e., lived alone vs lived not alone is also an important predictor for patients to be discharged home after stroke rehabilitation. CLINICAL REHABILITATION IMPACT: If current discharge planning relies on the availability of a caregiver at home after discharge from in-patient stroke rehabilitation then it may be worthwhile to include these caregivers in the inpatient rehabilitation process, to prepare them for their loved one’s return home. Additionally, once the patient is discharged home more resources should be made available to support caregivers in the community. This may include more home healthcare personnel training and availability along with respite care.